Recently, Gov. Brownback held a press conference to invite Kansans to email him ideas for a new school finance formula. That sounds nice. Can anything be wrong with asking people for input? Well, actually, quite a bit. 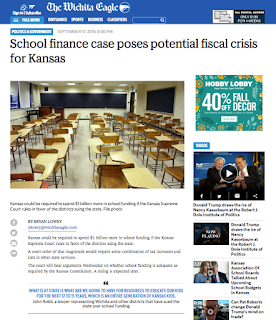 The big problem: A new school finance formula requires resources—money—and Kansas does not have any. The governor asks Kansans to think expansively, but offers no means to make those ideas real. Tell someone to imagine their dream home. Encourage them to draw plans, and do it up just right. But if that home is financially out of reach, cheerleading has done little for them. The exercise is just something fleeting, a dream, a temporary escape from reality. The governor’s own policies created the grim education finance situation that Kansas now faces. Income tax cuts and the LLC exemption caused a large block of general fund revenue to disappear. Before the tax cuts, Kansas had a workable school finance formula, but one which logically boosted funding for schools when enrollments and operational costs went up. With state finances spiraling downward, a formula requiring increased state aid could not stand. The governor and his legislative allies summarily scrapped it for block grants, first cutting classroom aid and then freezing that lowered funding level in place. The block grants have not worked well. They immediately caused unequal funding between school districts, and further, they have failed to provide for the future as student counts rise and needs increase. Beyond these problems though, the dirty little secret is that Kansas cannot even afford the block grants. In the fiscal year that just ended June 30, the Kansas general fund spent $500 million more than it took in, even with block grants in place. That happened despite the fact that $100 million in bills were deferred for payment in a future fiscal year. The general fund only stayed afloat by grabbing huge amounts from the highway fund, and raiding the balances of other funds, including those set aside for kids. In our current fiscal year, the same thing. Higher education and Medicaid providers—doctors, hospitals, nursing homes—have already been hit hard with emergency budget cuts, but more reductions will have to be applied somewhere, just to keep the general fund solvent. Participate if you wish. Email those ideas in, but don’t be deceived. Until the governor faces up to the severe budget problems his policies have caused, until lawmakers close the LLC exemption, until Kansas rights its financial ship, any hope for an improved school funding formula remains completely unrealistic. You—and the governor—are just dreaming. —This post originally appeared in a variety of Kansas newspapers.